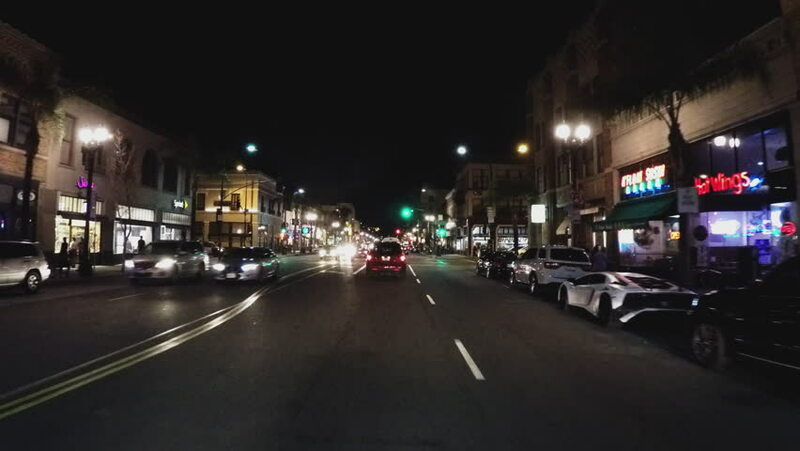 PASADENA, CA/USA: February 21, 2016- A night time driving shot through the downtown shopping district in Pasadena California. A vehicle passes by shops, restaurants and night life. hd00:05A night time time lapse from a street corner of Venice Beach in southern California, USA along the coast of the Pacific Ocean. 4k01:30Hollywood: Los Angeles, CA USA Set #44 - Left Front 3/4 View angle: Car travels E on Hollywood Blvd. on a clear evening in light traffic. Shot on RED Dragon. hd00:28SALT LAKE CITY, UTAH - 13 APR 2018: Night traffic transportation main street in Salt Lake City, Utah. Capitol city of state. Tourist destination. Business section. Establishing shot. 4k01:30Hollywood: Los Angeles, CA USA Set #45 - Rear View angle: Car travels E on Hollywood Blvd. on a clear evening in light traffic. Shot on RED Dragon.